In my previous post on the Smith and Wesson 929 competition upgrades, I discussed the parts that were swapped on my revolver of choice for USPSA. Purchasing new gear for firearms is almost as fun as purchasing new parts! I spent a long time comparing options from manufacturers before settling on these items to assemble my current set up. I tried to select parts that were effective and budget friendly. The total cost for this gear is right around $350.00, but there are definitely cheaper options out there if you shop around a bit! 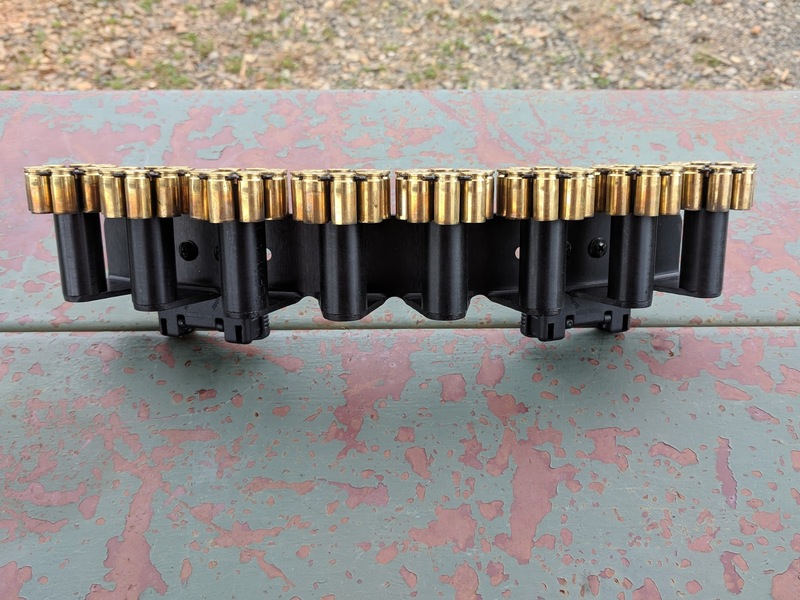 Empty brass to illustrate where live ammunition rest before loading. Loading and unloading ammunition in moon clips isn't always the easiest thing to do. I've seen people bend moons trying to use pliers. 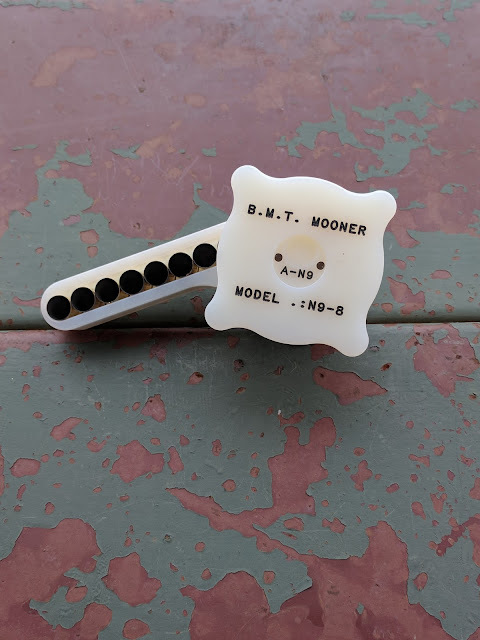 There are several loading devices out there, but the best investment I have made is a BMT Equipped Mooner N9-8. The two piece design is brilliant! Small magnets hold the moon clip in place on the top piece of the device, while loose rounds are placed in the chute of the base. There is a metal post that goes through the center of the base that acts as an index pin for the top to rotate and spin. Loading is easy! The left hand holds the base at a bit of an angle and the right hand rotates the top clockwise. This forces the cases onto the moon clip as the top is turned. But what about taking the spent cases off of the moon clip? B.M.T thought about this too! Remember the pin that indexes the top portion of the loader? The pin on the bottom of the base is used to unload the moon clip two rounds at a time as it spins. The small magnets hold the moon clip in place, ready for the loading process to repeat. It is a pricey part at $100.00 shipped, but I will purchase one for every revolver that excepts moon clips that I own. Inner and outer belt combo from Uncle Mike. The foundation of every competition rig is the belt. In my experience a stiff belt is a requirement to both support the weight of your gear and keep it in the same place while moving through a stage. The Uncle Mike's Competition Belt, while not the flashiest design, sells for all of $22 bucks on Amazon. I actually received this as a Christmas present from my fiance. 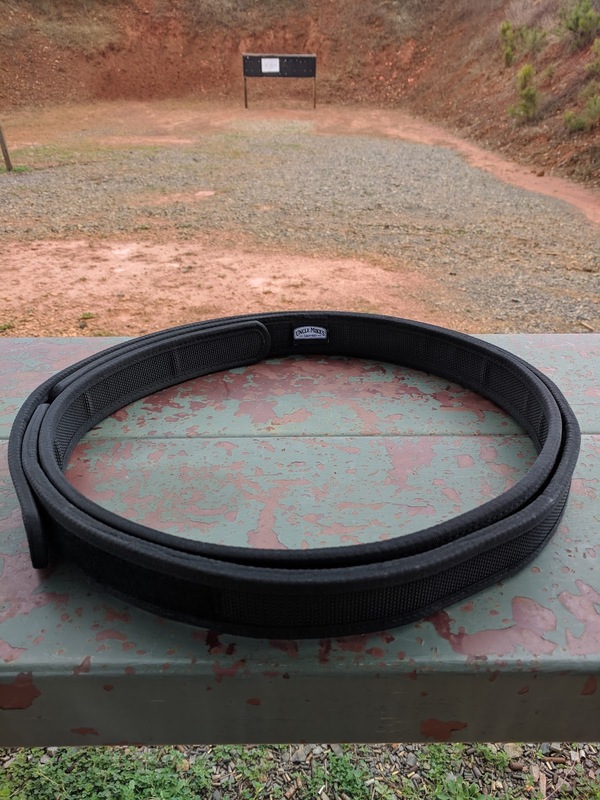 It is a great "starter" belt at a third the price of other competition belts. I may get one of the fancier belts down the road, but right now this is great. 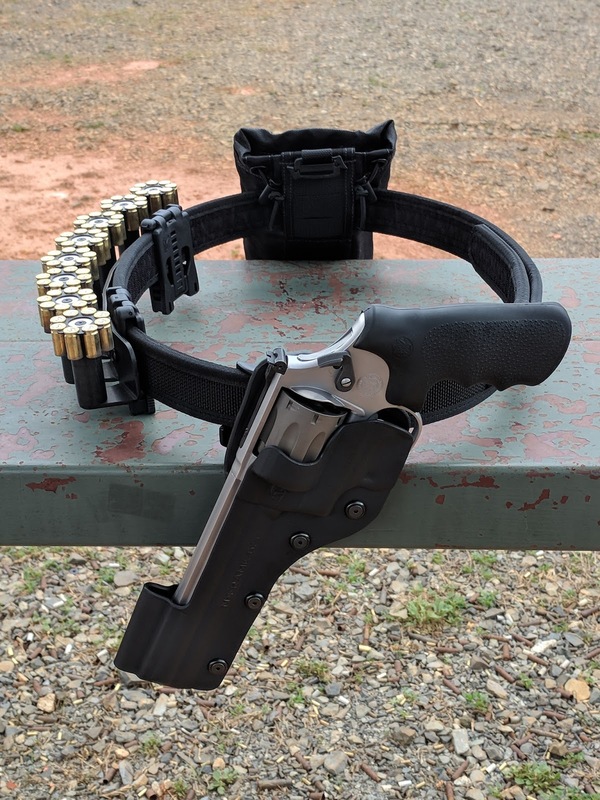 A good kydex holster secures the revolver while moving. Finding a holster for S&W 929 was actually a little challenging, especially for a lefty. I visited Comp-Tac's website because I have used Comp-Tac products with Glocks. There was about an eight day turn around listed on the website. Add in shipping and sales tax, the total was near $80 bucks. I decide to shop around and found a similar holster on the Speed Beez website. It turns out that the holsters are manufactured by Comp-Tac for Speed Beez. There are two different "cuts" available, one for IDPA and one for USPSA. At $64.95 it sure seemed like a bargain and there was free shipping over $100.00. 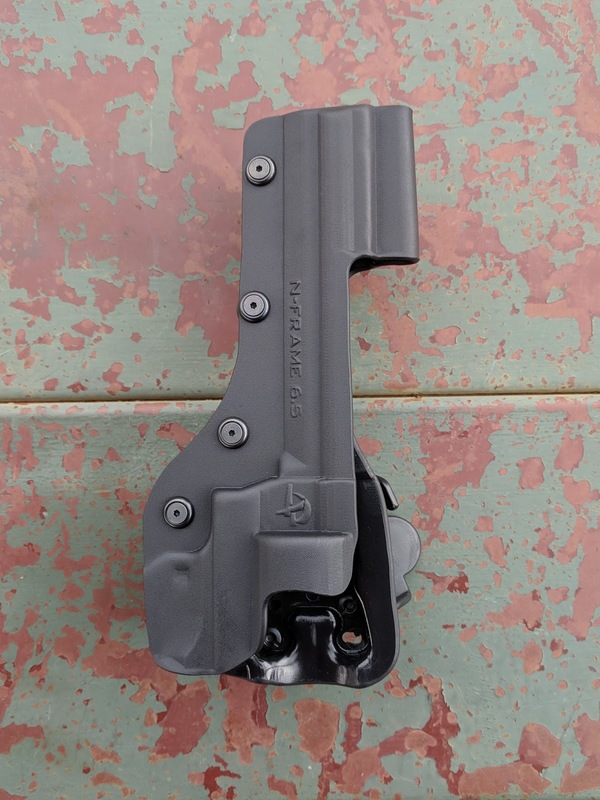 The holster ships with a TEK-LOK clip, a paddle mount, a belt mount, and a drop attachment. I opted for the belt mount for a super secure fit. The holster has several holes drilled so you can adjust the cant. I angled the muzzle forward for a slightly faster draw out of the holster. The draw feels a bit faster than my other holsters, but that could be in my mind. I'll run some drills with a timer and see which is faster. Pretty solid piece of gear for the money! Another important piece of gear is something to securely hold reloads. In the shooting sports, reloads must also be easily accessible so the process can be accomplished as quickly as possible. The moon clip carrier I chose is manufactured by Speed Beez. At $149.95 it is expensive, but it has several great features. I selected this model because of the eight post design that topped with magnets to securely hold moon clips in place and the TEK-LOK attachment system. This mount holds tons of ammunition: sixty four rounds worth to be exact. Eight moon clips is more than enough to ensure a stage can be completed, even if I manage to drop a reload. When I step up to the start position, the first moon clip will come from the third post on my right side. That leaves two on my right side for a right handed reload and five on my left side for my normal strong hand reload. On the occasion that I chose to shoot a bottom feeder in competition, I normally throw my empty magazines in my pocket as I follow the score keeper around to hear any points down. 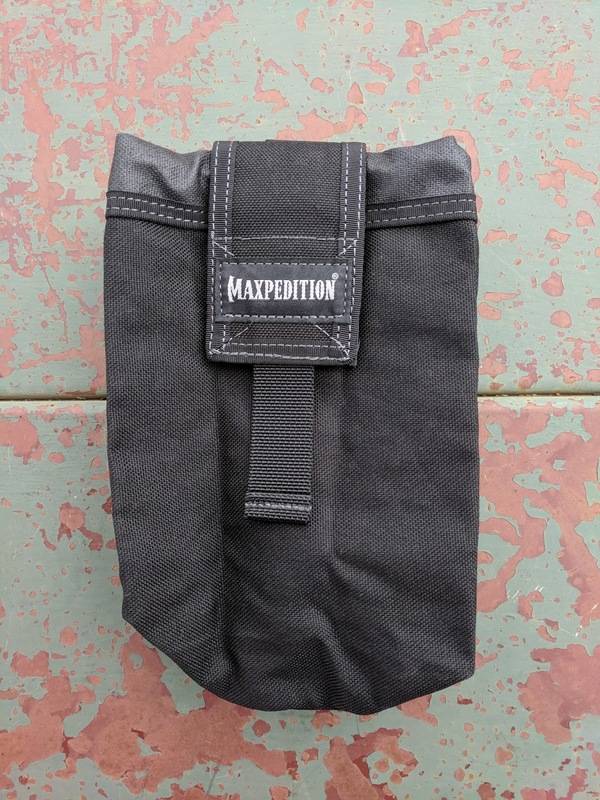 I would prefer not to fill my pockets with several moon clips so I purchased the Maxpedition Rolly-Poly to hold the empties. The website suggests an MSRP of $29.99, but I picked mine up off Amazon for about $19 dollars on sale. This is designed to hold a one liter Nalgene water bottle, so it is big enough to carry a handful of moon clips back to my pack to reload for the next stage. It may also find its way onto my belt to carry empty speed loaders back to my pack at IDPA matches. Many of the shooting sports are very gear-centric. There are many of companies that make firearms related gear for competition such as belts, holsters, pouches, and tools. This is a bit of a double edged sword. On one hand there area number of options, but there are so many options it can be a bit overwhelming. Well, most of the time. Unfortunately, the majority of this equipment is for magazine fed firearms. Simply put, there are not nearly as many manufacturers that make gear tailored for the wheel gun enthusiast, due to a lack of demand from revolver shooters. This really surprises me, as I would guess that many people have at least one revolver in the stable. If you already have a revolver, there is no reason not to try competing with it. Shooting a revolver is a challenging experience, but one that will make you a better shooter overall. Lastly, if you are anything like me, assembling the perfect gear is probably as much fun as practicing and competing at your local match.